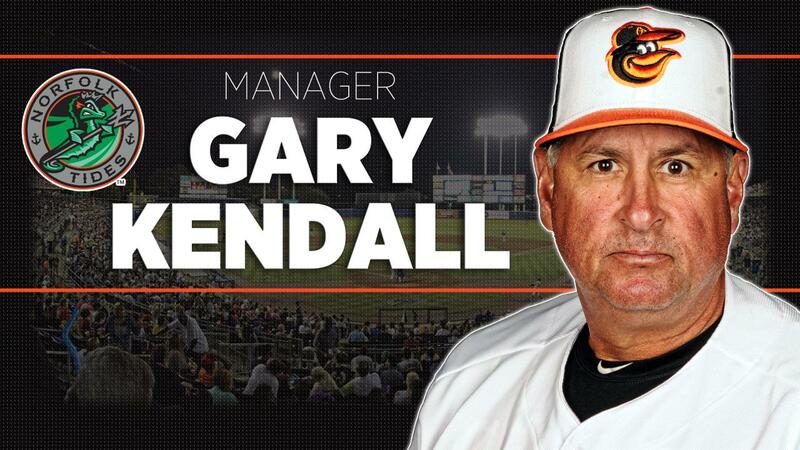 The Norfolk Tides and Baltimore Orioles today announced that GARY KENDALL has been named Norfolk's manager for the 2019 season. Kendall joins Norfolk after an eight-year stint where he managed the Double-A Bowie Baysox. "Gary Kendall has an excellent track record of developing quality talent, and we're excited to see him make the jump to Triple-A this season" said Tides General Manager Joe Gregory. "We've heard nothing but good things about Gary from our friends in Bowie, and we're eager to see him guide the next wave of talented players through the Orioles system." Kendall, 55, is entering his first year in Norfolk and his 20th season in the Orioles organization. He spent the previous eight seasons as the manager of the Bowie Baysox, where he set the club's franchise record with 570 wins. Kendall led the Baysox to a postseason appearance in three of his eight seasons with Bowie, including the franchise's lone Eastern League championship during the 2015 campaign. Following the 2013 season he skippered the Surprise Saguaros of the Arizona Fall League, helping lead them to the AFL championship. Kendall's also managed at Class-A Delmarva, Short-Season A Aberdeen and Rookie-level Bluefield in the Orioles system, amassing 902 career managerial victories over his 19-year career.